Manis and pedis are so much fun to do on your own. It’s also great to show off your masterpieces whenever you go out, no matter the occasion. It is also important to look after the health of our nails so that they do not chip or split from the sides. For me, growing my fingernails is a tall order since my hands I pit them through their paces and follow two toddlers around who are adventurous. Since I and always on the hunt for great nail care products, I was glad when I was asked to test Trind’s line of products. 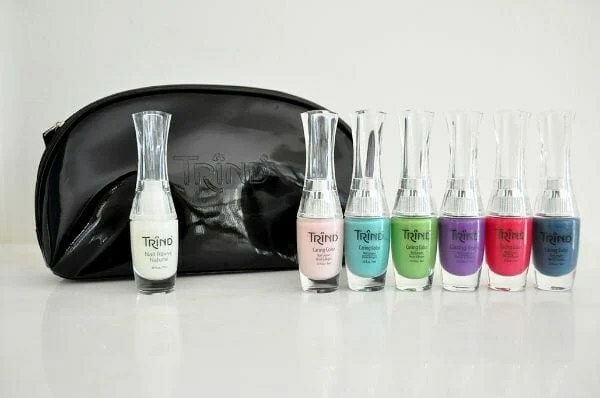 Trind created a nail care products that strengthens nails while making them look fun and flirty. Their products do this with their unique formulation that fortifies the protein molecules without changing the balance of its essential moisturizers. This makes nails strong, flexible and supple, preventing nails from drying out. I decided to test the Nail Revive Natural exclusively on my fingernails because they are not as strong as they once were. It is a formaldehyde free nail strengthener that fortifies weak nails while keeping them supple. This product was so simple to use! In order to see the results from this product is to paint my nails with it for two weeks to start seeing results. The only drawback was that I had to remove the coat I was wearing the day before I could put on the next day’s coat. From my first coat to Day 14, my fingernails looked spruced up and cute. At the end of the test period, my nails felt stronger, and did not start to crack from the sides like they usually would after trying to grow them for this length of time. I now use the Nail Revive Natural once a week to continue to keep my fingernails strong. 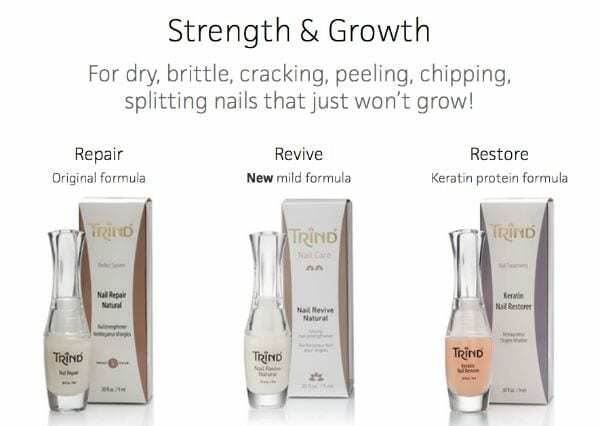 Trind has two other products that aid in restoring the balance of protein and moisture to your nails! Trind Nail Repair is an incredibly effective nail strengthener with an “extra-strength” formulation. It works by reinforcing the connections between protein molecules to create a strong yet flexible nail. It applies like a polish and dries with a glossy finish. You will see visibly stronger and healthier nails in as little as two weeks! Another product to use to repair damaged and brittle nails is the Trind Keratin Nail Restorer! It is an extra-mild moisturizing and strengthening treatment was created specifically for those with weak or damaged nails who are looking for a gentler solution. It rebuilds brittle and fragile nails, and repairs damage due to repeat use of gels, acrylics, artificial nails or exposure to solvents or environmental toxins. This product contains a high concentration of the protein Keratin, which restores and strengthens the structure of the nail. Special hydration properties keep nails flexible, preventing chipping so the nails can continue to grow. It is great for sensitive nails damaged after using artificial nails. The Trind line of Caring Colors I received is a part of the trendy Summer Color Wardrobe of polishes. These polishes have been specially formulated to fortify and improve the overall condition of your nails. They help to build a better nail while having a gorgeous manicure. I decided to do something fun and try two different colors from the Trind Caring Colors on my toes at the same time! I wanted to go with a warm feel on one foot and a fresh look on other. On my left foot I used Purple Sunset, and on my right foot I used Mint Julep. I felt that both of these colors from the Summer Color Wardrobe looked fun on my toes. To me, the Purple Sunset gave off a more of a calm and relaxing tone, while the Mint Julep felt free and breezy. My toe nails felt stronger and more flexible once I removed these colors from my toenails. 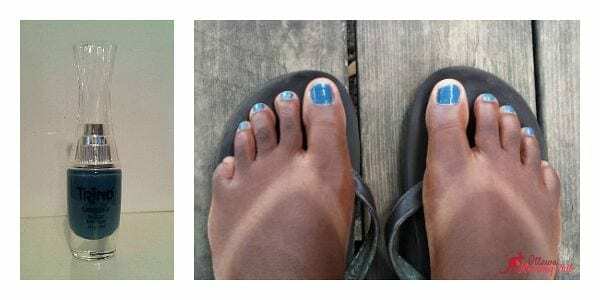 I liked both looks on my toes at the same time and I can’t wait to have them on my toes separately. My favourite color from the Trind Summer Color Wardrobe of Caring Color polishes is Cadet Blue. When I put this shade on my toes, I could not have been happier! Besides blue being my favourite color, it looks fabulous on my toes. For me, it also feels chic and fun. I would wear this shade all the time! With all of the Caring Colors I wore on my feet, the quality of the polish was amazing! The finish each color was bright and glossy, giving a gel-like look. I wore each shade for a week, and the color did not fade or chip, holding strong until I removed them. The Trind Summer Color of Caring Color polishes are fantastic! The black patent-look cosmetic bag is great for holding and carrying all of my Trind nail care products with room to spare for all of my other nail care items. It is also soft, so it is easy to pick up. The gloss finish to this bag give it a chic look I love. Trind is providing a special offer for Ottawa Mommy Club readers! You can get 2 Caring Colors for the price of 1! Use coupon code CARING2FOR1 at checkout to take advantage of these savings. These hot new shades are straight from the most popular salons in Europe, and Trind wants you to get in on the mani-pedi fun! I loved using the Nail Revive Natural polish and the Trind Summer Color of Caring Color polishes! These products look great on both hands and feet while caring for the nails they adorn. The finish is amazing and lasts for a long time with regular every day wear and tear. I can’t wait to try them all! For more information about Trind, you can connect with them on their website, as well as their Facebook , Twitter (@trindnails), or their Pinterest pages! Disclaimer: I received products from Trind in order to write this review. The views expressed are my own. This giveaway is open to US/CAN residents and ends at 11:59 EDT on October 12th, 2015. Rules: Open to residents of Canada and the United States who are 18 years of age and older. You have 48 hours to reply by email once you are notified as the winner. If you don’t, we will draw another entry. Prize is non-transferable. No substitution or cash equivalent of prizes is permitted. The selected winner must correctly answer a mathematical question in order to win the prize mentioned above. The Ottawa Mommy Club is not responsible for prize fulfillment and for the delivery/shipment of the prize(s) mentioned above. For our complete set of rules, please click here. I like the Trind Caring Colors in Mint Julep. The purple is on trend for Fall! The Trind Caring Colors in Cadet Blue is my favourite. I really like Trind Caring Colors in Miss O’Hara. I’d like to try the Restore! They are all wonderful but I especially like the Trind Caring Color in “Purple Sunset”. I like the Mint Julep color the best. I’d like to try the Restore!! They are all so pretty. The Pale Pink is the one I would use the most as I love pinks. I love the Mint Julep polish! So pretty! I love the Purple Sunset! The Trind Nail polish colour I prefer is purple sunset. Purple is my favorite color, I just love it. 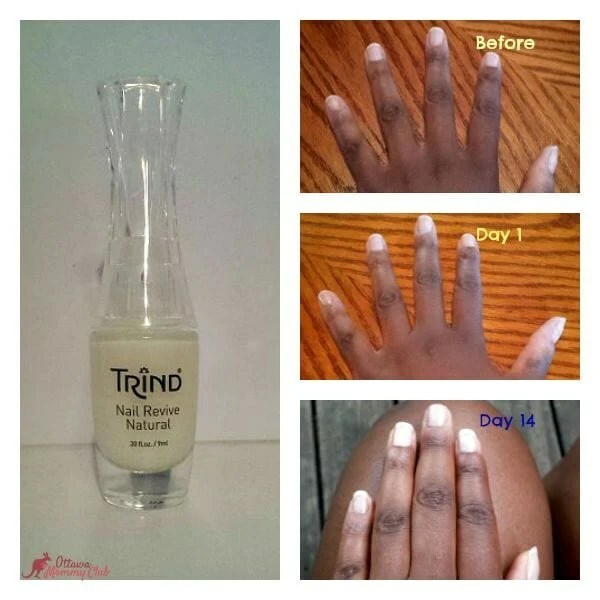 I’d really love to try the Trind Nail Revive Natural. Thank you so much for the opportunity! I like the light colours best so would likely wear the pale pink one the most. I’d like to try the Restore polish!!! I’d like to try the Restore nail care. Mint Julep is my choice. I love them all but purple sunset would have to be my favorite. I love the Trind Caring Colors in Purple Sunset. I love the Cadet Blue – Looks pretty on you too! I love having pretty nails! I like the Trind Caring Colors in cadet blue. I would like to try Trind Caring Colors in Purple Sunset. I really like the Cadet blue. I like to try the Nail Repair Kit. Purple sunset is my favorite colour. I would like to try Trind Caring Colors in the Purple Sunset. Trind Caring Colors in Pale Pink thanks. the purple sunset is my fav. i would rock cadet blue and purple sunset !!!! My favorite color is Caring Color (CC117) Violet Red. I love the Cadet Blue. I really like the Purple Sunset shade. It’s always the pinks and purples I like. I love the Trind Caring Colors in cadet blue. I think I would have to pick the pale pink. Neutral colour is what i prefer. My favourite colour is the Purple Sunset.